A great sandwich is . . .
A really great Corned Beef sandwich exceeds your ability to anticipate the flavor, texture and delight being revealed in the next bite. Each bite, while still familiar, is a first bite. That's a great Corned Beef sandwich. I was out and about today, first in Tremont, then downtown and finally a lunch-time event on the west bank of the Flats. The Meetup page for this event was screwed up and I thought I was saving money by bringing my own lunch, but alas, that wasn't the case. 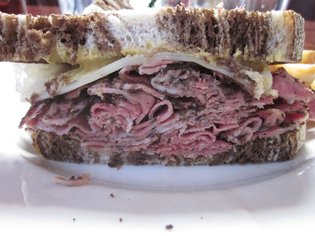 In any event, I took advantage of being downtown to call up Ontario Street Cafe and order a Corned Beef on rye with mustard and swiss cheese, chips and a pickle for eight bucks even (a little steep). When I arrived, Carl (he spells it with a "C") remembered me, thanked me for remembering them and packaged an awesome sandwich for me to take to my meeting. 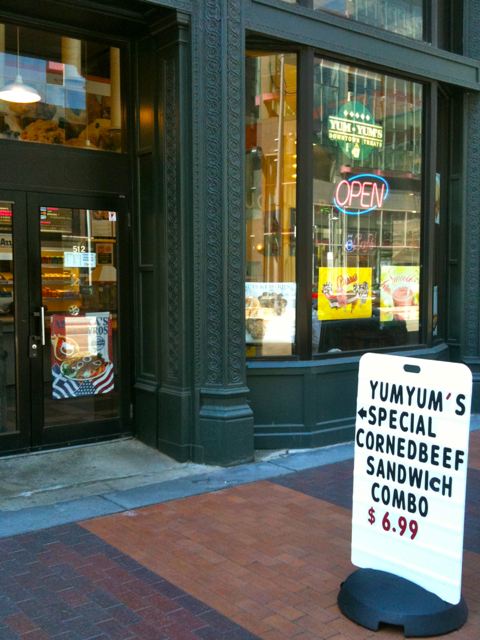 When I arrived, I sat next to a fellow who commented that since he was downtown, he'd have to stop by Slyman's for a Corned Beef sandwich before heading back to the eastside. Now how could I let that sort of a comment go?!! So I asked him how he likes Corned Beef and he tells me. 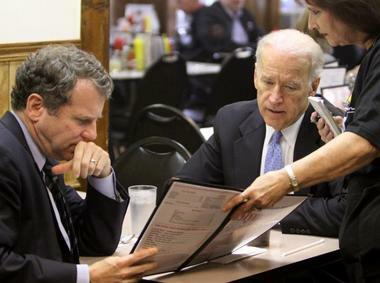 I ask him about lean and crumbly and swiss cheese and what type of mustard, etc. By his answers, I could tell we were kindred spirits of sorts. When I proceeded to open my bag and pull out what he had just described as a perfect sandwich, I thought he might jump me and take away my lunch. 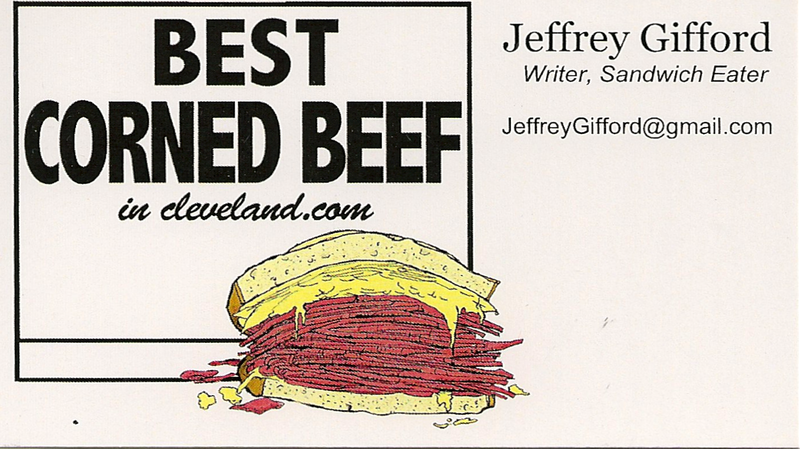 So of course, after the meeting ended I scribbled "Need Sandwich Writers" on the back of one of my Best Corned Beef in Cleveland dot com cards and handed it to him. He's going to think about it. Maybe we'll see his name on these pages soon. And who is Carl? He's the guy at Ontario Street Deli who makes these awesome sandwiches. Drop by and tell him I sent you. 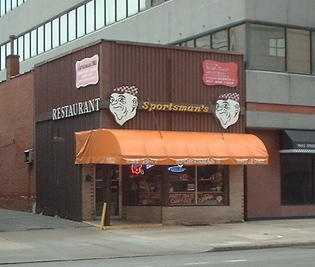 The Cleveland Plain Dealer reported earlier this week that The Sportsman Restaurant and Cocktail Lounge will close at the end of this week. We ate there a while back and found their sandwich "excellent". Passions run high about the place as seen in one of the comments. While taking pictures of the outside, I was accosted by someone who really did think theirs is the best. I'm going to try to slip over there myself tomorrow and grab one for home. I'll miss it. I haven't had any amazing Corned Beef recently and I've been wondering if that's because of serving size. And bread. And temperature. But mostly serving size. Yes, the quality of Corned Beef makes a difference, I won't argue with you there. And the leanness also impacts one's joy. But more than that, I don't think it's possible to have truly "Best" Corned Beef by sampling a few slices. Somewhere between a quarter pound and a half pound is where the bliss lies. I'll let you know if I have any revelations surrounding mustard.